Not so easy to stay in the ear but good sound quality. The speakers inside the EarPods have been designed to minimize sound loss and maximize sound output. So you get high-quality audio that's just as impressive as what you'd hear from more expensive headphones. Item as described original from apple. My niece and nephew wanted Apple earbuds for Christmas. On Overstock, they were half the price of Amazon, Target, or some official Apple outlet. I received them within the next couple days, well ahead of Christmas. I only gave this three stars not because of anything Overstock did, but I'm an iPhone user and I hate the quality of their headphones. If you use them at work or while commuting, you hear everything around you over what you're listening to. They do not block noise at all, which is why I purchase Skullcandy for myself. They're cheaper and work much better at blocking ambient noise. Great earpods. So far, these work on my device, so I'm thinking they are an Apple product. Unlike others who say they are Apple products, they only work for a song or 2 then it flips over to Siri for no reason. So far, so good. There are a lot of Earpods to choose from. The sound quality is clear and has great volume. They were used on a phone that was not an Iphone and there worked perfect. They were shipped and received as promised. I will always buy these earpods. These earphones are actually better than the earphones that originally came with my iPod Touch. Very much worth the price! Actual old-school Apple earbuds. Perfect sound. Love them. A old time favorite. Good quality; nothing like Apple. Bought for teenager and she squealed with happiness when she got them! The product looked great, seems to be true Apple product. Unfortunately the volume control buttons and center button to change songs and answer the phone didn’t work. Immediately returned but customer was great. These are either not the real earphones or I got very unlucky. Out of the box one of these earphones would not work if the cable was slightly twisted. As we all know, earphones twist themselves and trying to stop that from happening is impossible. I would not recommend these to anyone I like. These are so much cheaper on here than on other sites and they are brand new. Perfect fit for my phone!!! "I didn’t see 7 plus listed as compatible. Can you clarify?" iPhone 7+ is not listed to be compatible. However, if the 7+ features a 3.5mm plug it might work. "1. 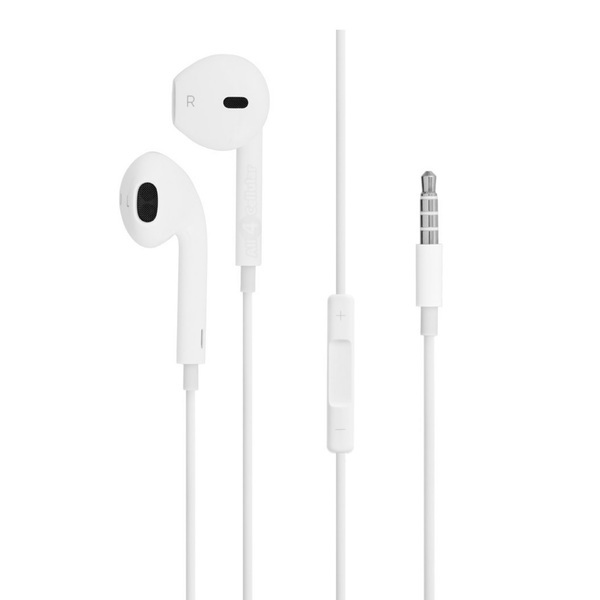 Are these actually Original Apple brand earpods same as they will come with the iphone? or are oem quality? there is a big difference." "Do they come with a case for the headphones"
These come with a jewel case. My husband could not find the one that came with the phone. Same product at a cheaper price! My husband has an Apple 6s plus. He likes to charge his phone while listening. That requires the older style plug. "Are these actually Apple branded ear buds? I don't want a knock-off pair!" Yes, these are OEM Apple ear buds.